With winter fast approaching I’ve had a lot of people asking me how to keep your chickens warm in the winter. Not only that, they’ve actually said they gave up raising chickens all together because they couldn’t keep them alive! I was absolutely shocked by this because I’ve had at least 3 people in the past month or so say this to me! It’s been quite awhile since we put in the coop and brought home our first chicks. So, to come up with an answer I really had to sit and think about it. Sharing is caring!! Pin me for others!! Before anything, including building your coop, you actually have to do a bit of research on the type of chickens best fit your climate. We had a pretty clear image of what we wanted when we started with our chickens. We wanted a dual purpose breed. We wanted them to be friendly (because believe it or not I was terrified of them before we got started!). This helped us to decide on Buff Orpingtons. These are great winter hardy birds, but I will say this. Be mindful of where you get them. I am guilty of caving into the cute peeping at Tractor Supply and feed stores. But quite a few of my local chicken friends have said that they had these birds and they were extremely small compared to my flock. 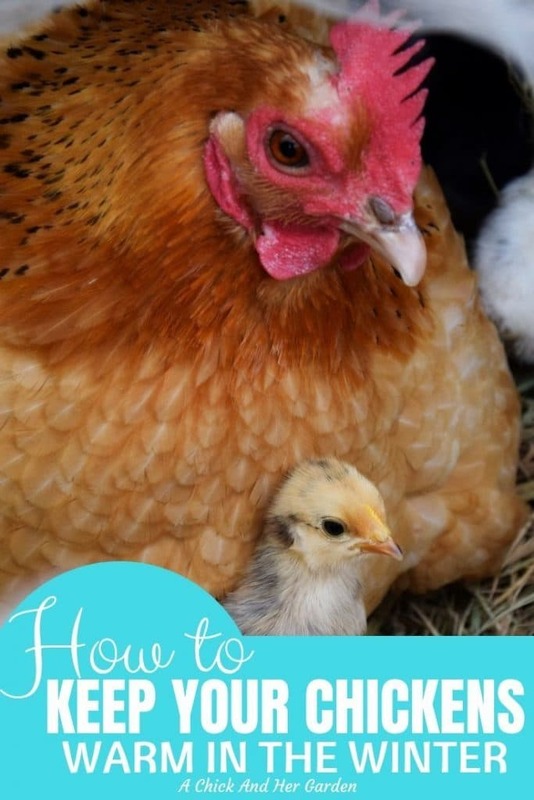 Knowing how to keep your chickens warm in the winter means, knowing the right amount of space for the amount of birds you have. A good rule of thumb is 2.5-3 square feet per bird. They need each others body heat to keep warm. Having a lower ceiling also helps. Having more space than you need not only makes it colder, but when it is colder they tend to pile up on each other and could actually trample each other to death! Help to hold in heat by insulating your coop. We were fortunate enough to have some leftover fiberglass insulation from a job that my husband had just finished. But you can use whatever insulation works best for you. We are pretty adamant about not using electricity in our coop. You can read why here, and how we have eggs in the winter without it, here. Without electricity, that means heating without heat lamps to keep your chickens warm. So how do we do that? We heat with compost! Actually it’s their bedding which is later used as compost. Compost generates heat, so we allow the bedding to compost itself in the coop. There’s a process to it, so keep an eye out for a new post explaining the process! Sounds tricky right?? Ventilation is needed to keep the moisture down in the coop, which can cause frost bite. But, drafts are a moot point to your heat in the coop. So how do you ventilate without drafts? Make sure your ventilation is well above their heads while they’re roosting, and make sure to plug any drafts below that point. I’ve seen people use anything from straw bails, to old feed bags blocking their coops and runs from the wind. By blocking the run as well you are giving them a sheltered area to get outside a bit. Not only is scratch like crack to chickens, it helps to keep them warm! Weird right?? Well, not really. It takes a chicken more energy to break down scratch than typical feed. And with that energy comes body heat. Just like you moving around to keep yourself warm. Imagine how much better you feel with a hot cup of coffee or tea in your hands on a cold day! Your flock will not only thank you for a hot treat, they might run you over to get it! Some treats you can give are scrambled eggs or oatmeal. I love to take this opportunity to incorporate things like herbs, cinnamon and molasses into their diets for their healing properties! Now that you know how to keep your chickens warm, don’t forget to keep them hydrated! Check out how to keep their water from freezing without electricity here! Do you have any more tips for keeping your flock warm in the winter?? Tell me in the comments! I have heard (and tried) adding cayenne pepper or red pepper flakes to their feed, and it warms the birds from the inside out. Supposedly, they don’t have heat receptors in their mouths, so they don’t taste it, but it works just like a human taking it in pill form…..if you’ve ever tried it, it makes you feel like you’re starting to get a sunburn. I’ve tried it with my hens, and have to believe it helps. I have cared for chickens for 6 years, and never lost one due to the cold. Oh, I also live in Michigan.